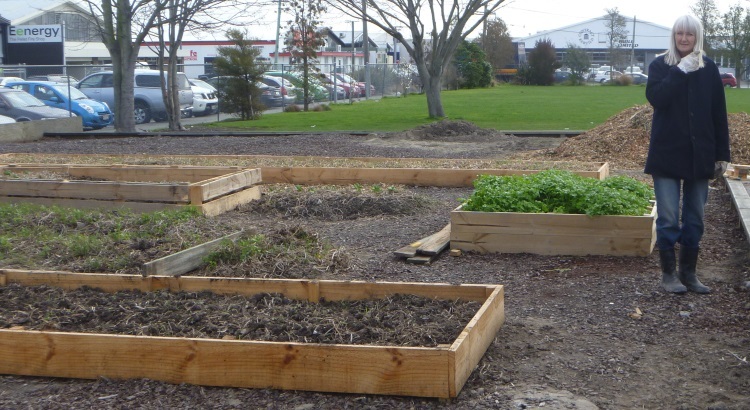 One of the more common jobs the LMS gets involved in is making raised wooden garden beds from fence palings. 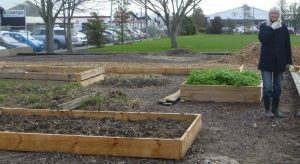 Normally the requested work doesn’t arrive with the instruction to use fence palings, but after reviewing options it’s normally decided that fence palings are the best and most economical option. Feel free to read why we use fence palings below or skip straight to the instructions. Standardised size – we know we can get the same wood from Bunnings, Mitre 10, Placemakers or just about any other wood supply store. Cost – Fence palings are inexpensive. Currently a 1.8 metre long, 25mm thick, 150mm wide paling costs $4.68. If you are building a two layer high, 1800 x 900 garden, then you will only need 6 palings, costing you $28.08, plus a bit of pocket change for the nails and joining wood. Call it $30.00 If use 19mm thick palings the cost goes down to $3.32 per paling or $19.92 per layer, plus a couple of dollars for nails etc. We prefer 25mm as they are just more robust. 19mm is perfectly adequate. 12mm is a waste of time – it warps and is unlikely to hold together when nailed. Weather Proof – Fence palings are H3.2 treated which means they can stand up to the weather. H3.2 should not touch the ground, so using them as a garden is not ideal, but the reality is they will last for years. The downside is that H means hazardous – we have an article about that here. If you are concerned about this you can line the garden with polythene or cardboard. Non treated wood is available (but not normally as fence palings), usually in the form of macrocarpa. The costs for this wood are higher than treated pine. Another alternative is to use heat treated wood pallets and scavenge wood from there. 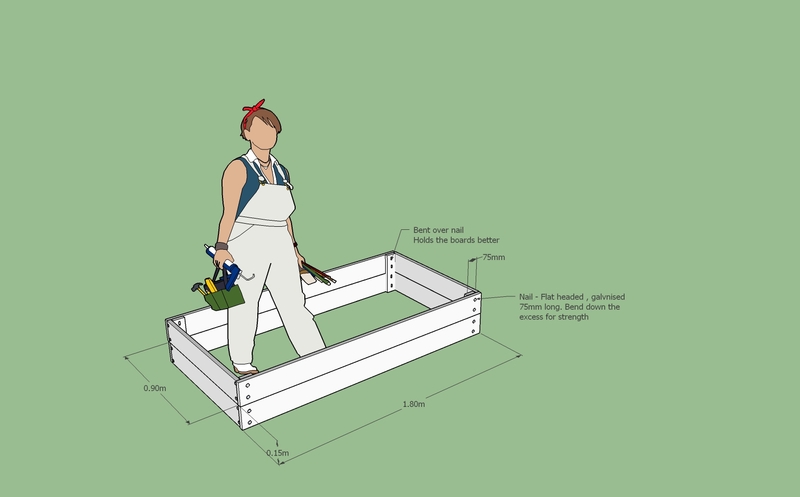 These instructions are for a two layer, 1800mm x 900mm garden. 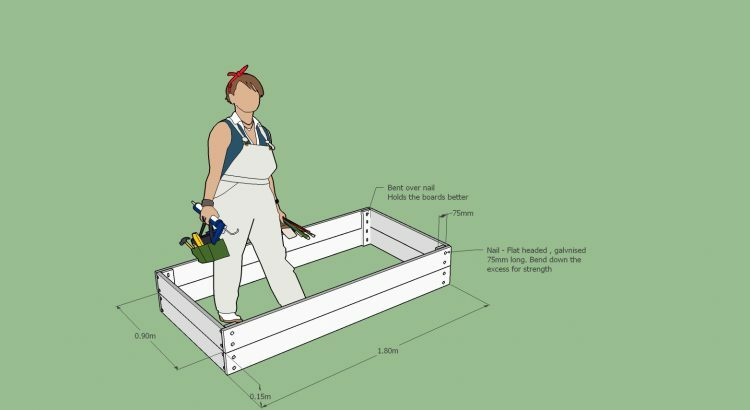 If you use 1200mm long fence palings (the other common length) then the instructions are the same but you will end up with a 1200mm x 600mm garden. There are also some alternative options shown below. Take your half paling (900mm long) and saw it length ways down the middle. You will now have 2 x 900 x 75mm pieces of wood. These are your bracing. Cut the braces into lengths 300mm long. You now have 6 x 300mm x 75mm wood. Take one of your braces (75 x 300) and nail it flush along the short edges of the two side lengths (two nails). The nail will be too long and stick out by about 25mm. Bend this over and hammer it flat into the wood so it doesn’t spike you later. By using an over long nail and bending it you add strength and stop the nails coming loose. As you nail the braces on make sure the long sides remain touching and the brace is flush with the short edge of the sides. Repeat numbers 4 and 5 with the other two long lengths. Stand the sides on their long edge, so they look like they will when the garden is finished. Nail the 900mm ends you cut in #1 to the ends of the sides. Use two nails per end (e.g. 8 nails total for the two end pieces). 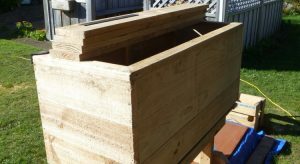 HINT When you are nailing the ends to the long sides, make sure the bent nails and braces are on the inside of the garden box. You are done. Oh wait..the two spare brace bits? I suggest nailing them half way along the long sides to add strength (or don’t – you may not need to). Some people don’t nail these in flush with the bottom but sticking below the bottom of the wood. That way they can be tapped into the ground to help hold the garden still and stop sides bending. If you are using 25mm thick palings these braces are normally not needed. 19mmit helps and if you use thinner wood you will definitely need them. If you don’t need them then they make dandy signs when you write on them with pen – marking what plants you have in the garden. If you make the gardens upside down (e.g. 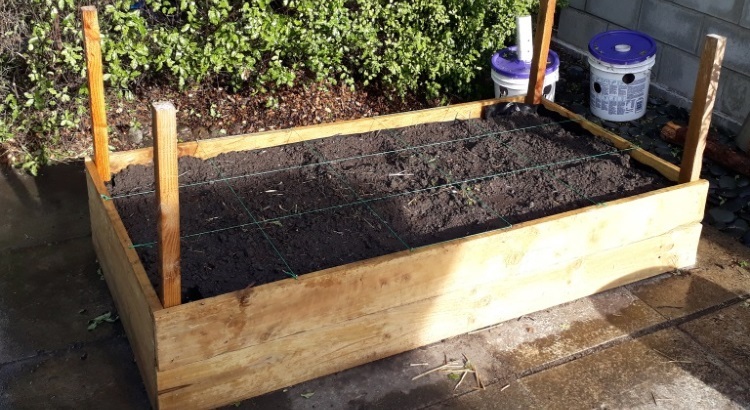 with the top of the garden on the ground when you are nailing on the ends and/or braces) then (when you turn it right way up) you have a perfectly even and joined top edge. Any mistakes (over laps, gaps etc) get pushed into the ground and hidden. Instead of nailing the braces flush with the wood, drop it about 50-75mm below the top lip of the garden. 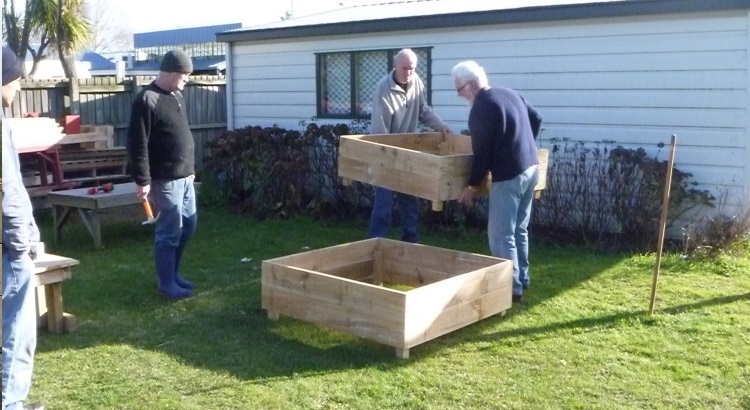 This means they will stick out the bottom of the garden and be tapped into the ground to hold the garden in place. Same as above but instead of using it to tap into the ground, use it to stack layers on top of each other. Instead of using bits of paling as braces buy some thick tomato stakes. These can be left sticking up to make frost covers holders for your garden. We also add bird wire around our garden to stop the veggie vampyres (aka the chickens, rabbits and guinea pigs) from sucking the life out of our garden. Rip (cut lengthwise) some palings into thirds (50mm wide). Nail these around the top to make a decorative / tidy top edge.